PRESTON, Md. 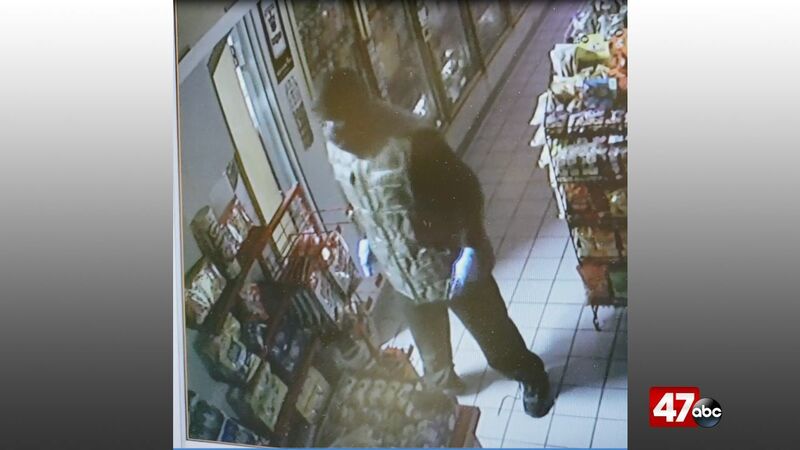 – The Caroline County Sheriff’s Office says they are investigating after someone reportedly robbed a local convenience store Sunday night. Police say they responded to the Super Soda, located at 101 Maple Avenue, just after 9:30 PM for a reported armed robbery. On arrival, it was learned that a concealed/covered male entered the store, immediately displayed a handgun and demanded money from the register. The suspect then took an unknown amount of money before fleeing the store on foot in the direction of Chambers Street. The suspect (pictured above in store surveillance video) has been described as a tall male, wearing a dark green puffer vest with a black long sleeved under shirt and black hood, black face mask, black shoes, and blue gloves. Police say he was carrying a silver short barreled revolver. This incident remains under investigation, and anyone with information should call either 410-479-5980 or 410-479-4123. Those reporting information can remain anonymous.